We’re there for you when you need us. Our normal hours are 8 AM-5 PM Monday—Friday. However, if you have an urgent need for service, you can reach us at 719-578-1104. If you prefer to reach us via email, please use the form below to provide contact information and to include questions or comments about your HVAC needs. We will respond to inquiries promptly. 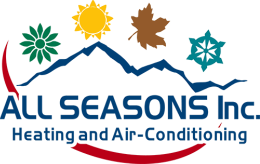 All Seasons Heating & A/C, Inc.